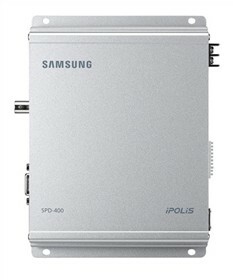 The Samsung SPD-400 is a standalone 4 channel decoder which provides max. Full HD 1080p video output for a single view and max. HD 720p for quad view mode. It is able to receive audio and video streams from Samsung network cameras and encoders via an Ethernet network, decode and output them in real-time via its HDMI/VGA interface. The SPD-400 allowes 1 x 1080p images and 4 x 4CIF images to be displayed at 30fps enabling real-time monitoring. It’s multiple codec function - H.264, MPEG-4 and MJPEG gives the system the flexibility to operate in any network environment. The Samsung SPD-400 has many exciting features for users of all types. See the Samsung SPD-400 gallery images above for more product views. The Samsung SPD-400 is sold as a Brand New Unopened Item.